Parent company Lance, have used exactly the same bag design for the Jays Potato Chips range. Tom's must be feeling a little bit insecure about their position in the marketplace - They almost seem to be shouting who makes the chips. There is however still room for a tiny explanation that the chips are 'Ridges' and the chips graphic, that is fairly accurate in its portrayal of the contents, along with an impressive graphic of a pot of Mesquite Barbeque Sauce, dripping over the chips. Not sure they need to add the negative, 'Artificially Flavored' on the front - maybe better to point out the 0g trans fats or the 0g of cholesterol. While these are not Kettle Cooked Chips, they do have ridges which ensure an additional thickness. There are not lots of broken companions for the biggest chips - and they make a nice crunch that remains consistent throughout the bag. Although the packet says in small letters that it contains ridged chips, it almost comes as a surprise when opening the bag. They are not major ripples, perhaps even describable as slight, but enough to confirm their thickness and there is also a nice dusting of reddish brown seasoning that would presumably be the Mesquite. 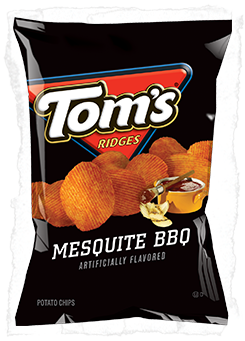 Tom's make a Barbeque flavor and a Mesquite Barbeque flavor. There is not a major difference in flavor to add an additional member of the range, but this example are is ridged, so you can see why they give it a different name. As far as flavor goes, it is a fairly standard barbeque, not that aromatic and not significantly fiery to put anyone off buying them again.